My Barbie collecting has been a little unexciting of late. There are quite a bit of different types of dolls I'm currently preoccupied with that I've somewhat snobbed the first plastic love of my life. Today, however, she is snobbed no more as I introduce to you my first silkstone doll of 2011. 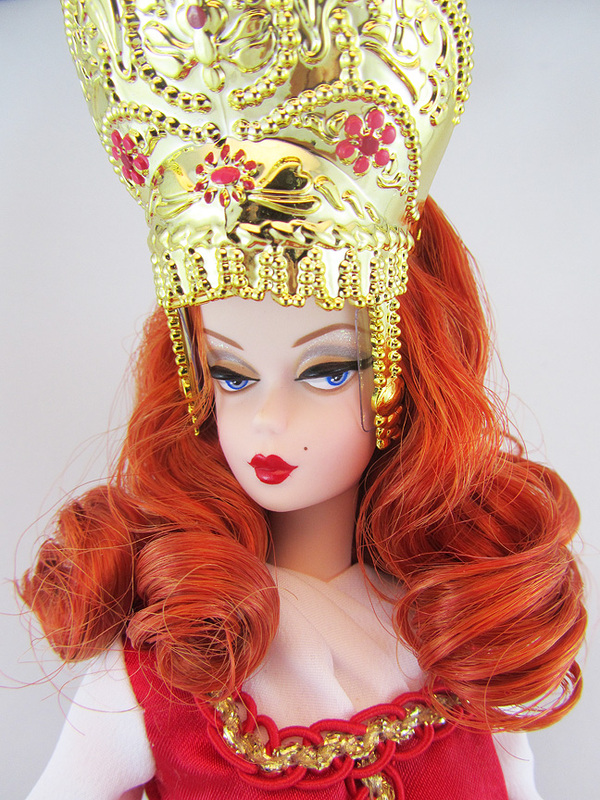 Ekaterina is a 2011 Barbie Fan Club exclusive. 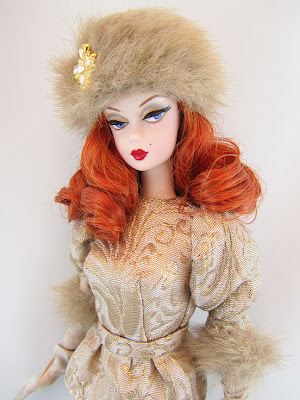 She's part of the Russian themed silkstone Barbie line. This doll held a lot of promise for me. There's something about redheaded dolls that are so enticing. So you can imagine my annoyance when I deboxed her and found a messy head of hair! Mattel's promo shots had her with awesome curls that danced around her neckline. When I picked up my doll, I just saw frizz....lots of frizz! The pictures seen here are my pitiful attempt at taming her wild curls, gel and all. I just couldn't get it the way I wanted it. It came to a point when I was tempted to dunk her hair in boiling water to straighten it. But I wanted her with curly hair so I left it at that. The hat really helps. One other thing I have to mention is the horrible lip paint. It looks like she just made out with Ken, with the paint going in different directions outside her lip line. Though it isn't as obvious in pictures, that really bothered me. And I wasn't about to go through the process of returning her, as Barbie Fan Club exclusive dolls cannot be exchanged. Luckily she's still beautiful, regardless of her flaws. 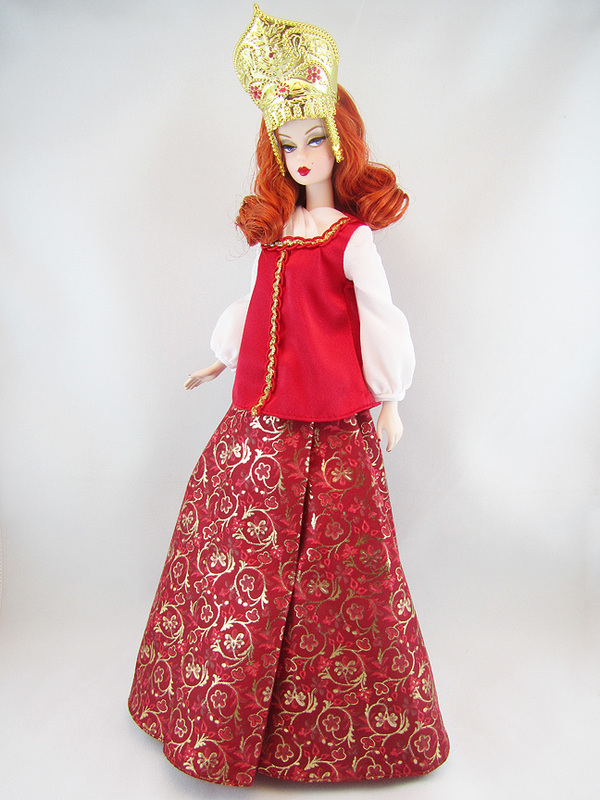 Here she is in the Dolls of the World, Princess of Imperial Russia Barbie attire. I was curious to know how she would look in something more traditional....She looks like a candy cane....But a pretty one! Next time we meet up I'll bring my doll hair water wax so we can try to fix up her hair. I've been using it on my doll wigs and it's been a life-saver! It's an inexpensive product, but only available from Volks (shipping! $$$) which makes it a bit annoying. Let me know when you guys get back so we can get together.